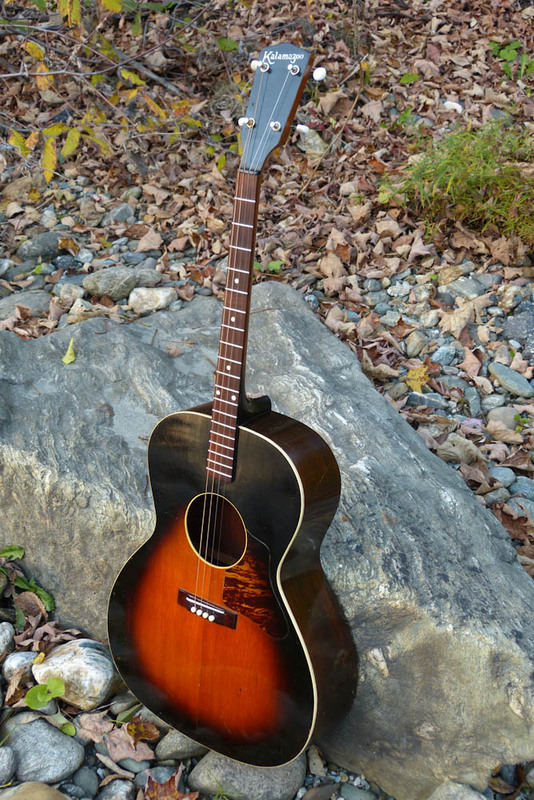 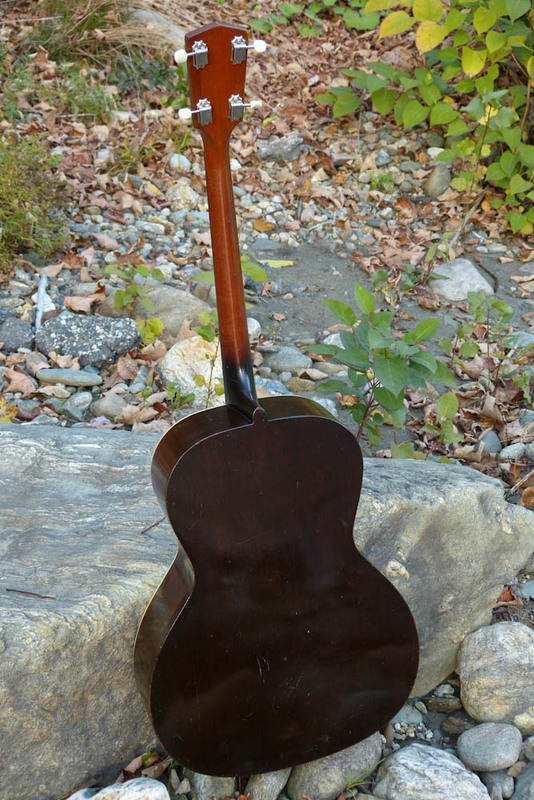 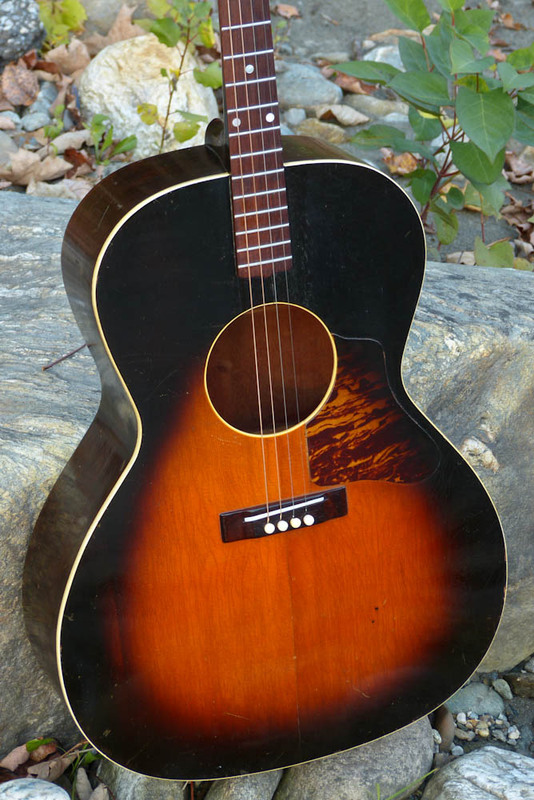 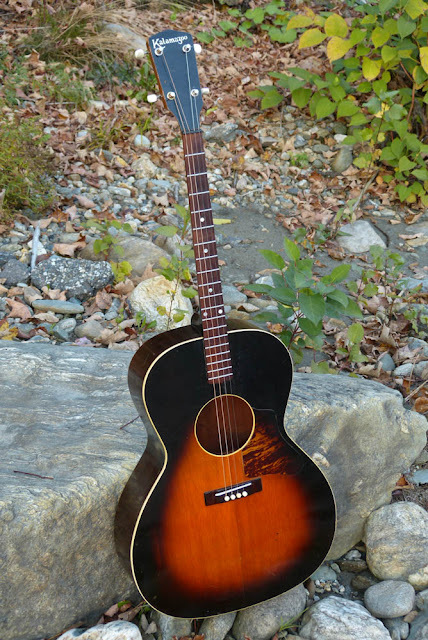 With 14 frets, a longer 22 3/4" scale, and a bigger L-00-shaped body, the KTG-14 was pretty modern for the 30s. 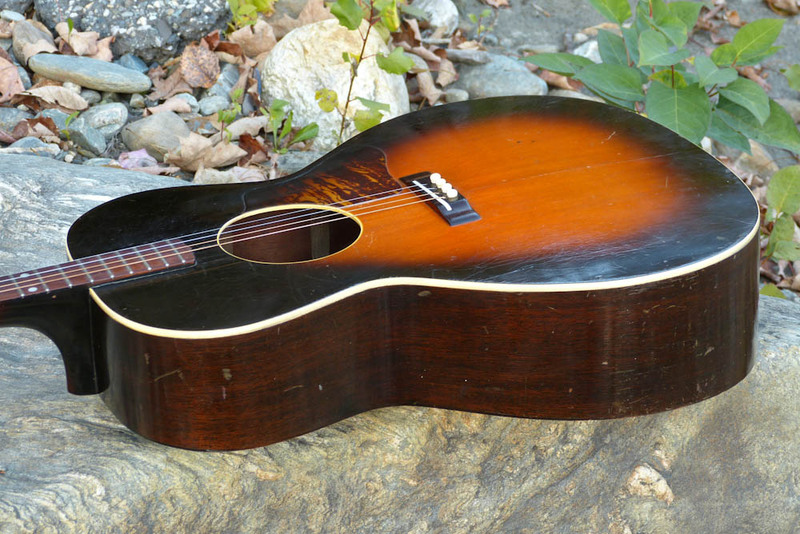 These are loud, punchy, gutsy guitars and the better ones have sweet, lingering sustain (like this one does). 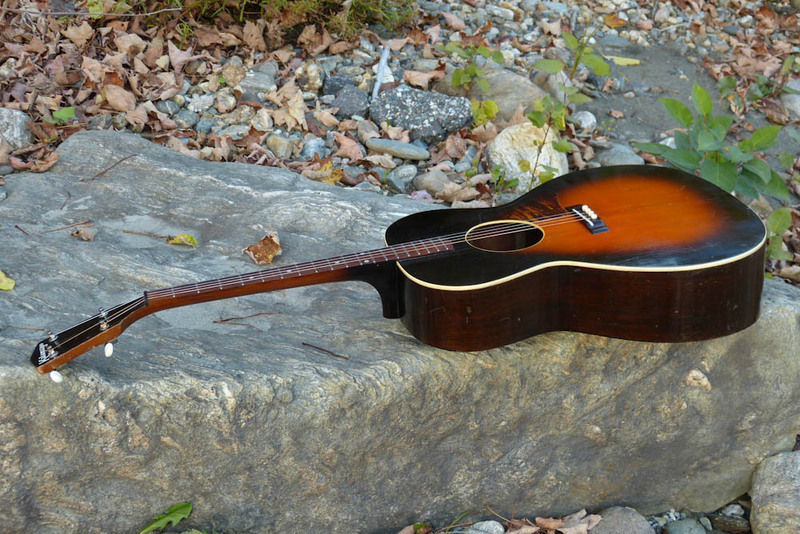 There's something about the high bridge location and short (for guitar) scale that gives these instruments some sort of supernatural power when you're sitting-in with one during a jam or acoustic gig. They cut in a very "old time" manner, though, without a harsh zip or zing on the high or low end. This was brought in by a consignor and while it was dialed-in OK, it did need one crack cleated, a new saddle and bridge adjustment, a fret level/dress, and good setup to get going. 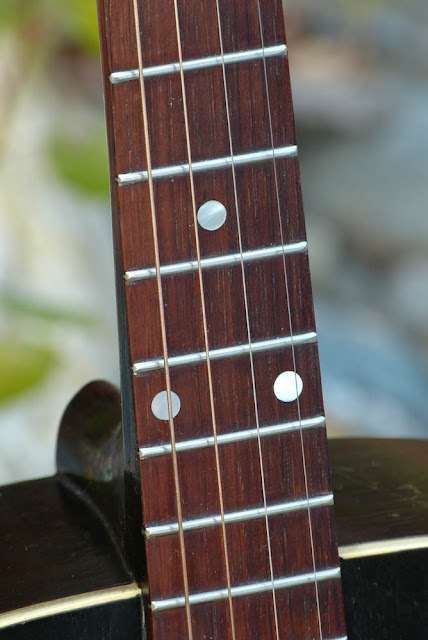 It now plays spot-on with 1/16" action at the 12th fret and is setup and intonated for CGDA and DGBE tunings. 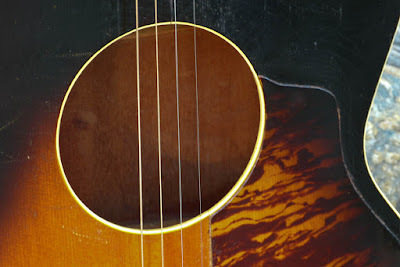 One can "octave mandolin" it into GDAE, though, if the A string used is a plain one. Otherwise it'd need a new saddle to play in tune up the neck. 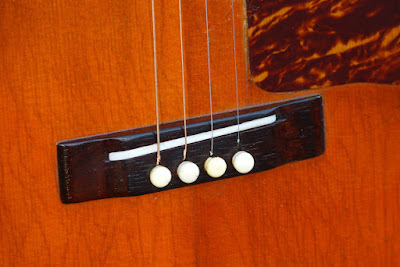 I don't suggest wound-A GDAE on these old guys, anyway, because the tension from those sets is usually pretty heavy for these tenors that were never intended for them. 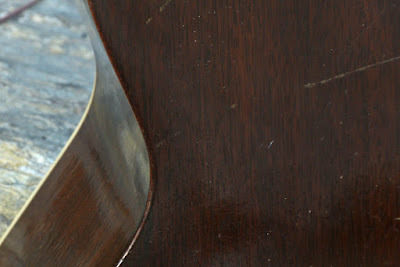 The overall condition is very nice. 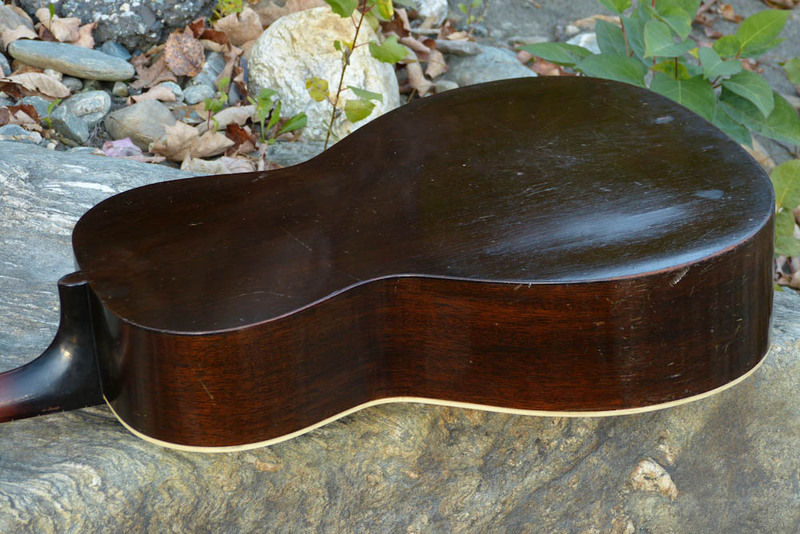 There are a couple of repaired small hairline cracks on the top -- one to the left side of the pickguard and one to a 1/2" one north of the soundhole -- but all is good in structural-stability-land. The top is solid spruce and is actually made from 4 pieces rather than two (somewhat typical for Gibson). The "large sunburst" pattern replaced the smaller-burst of the earlier Kalamazoo instruments and that's what this one has. The FON (factory order number) at the neckblock is very, very faint but I'm pretty sure it has a B suffix on the end of it which would indicate 1936 (which looks right for the build). 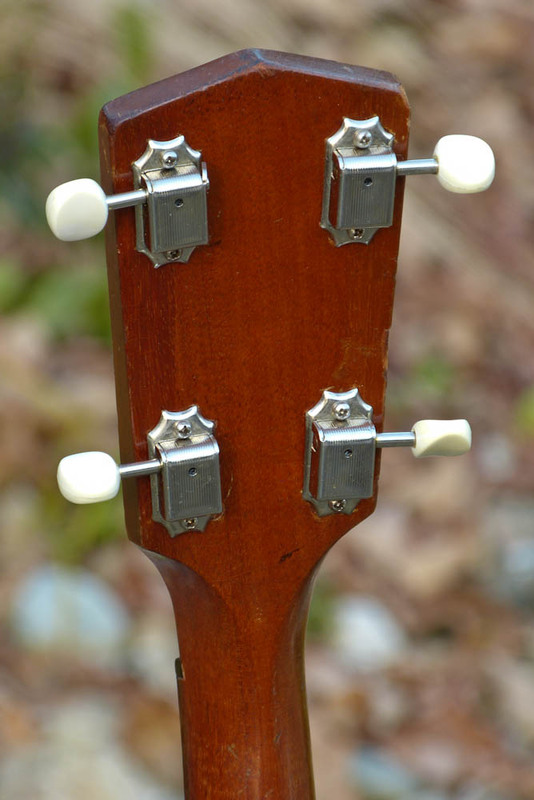 The instrument is all-original with the exception of these newer Kluson-style tuners, a new bone saddle, and older but non-original bridge pins. 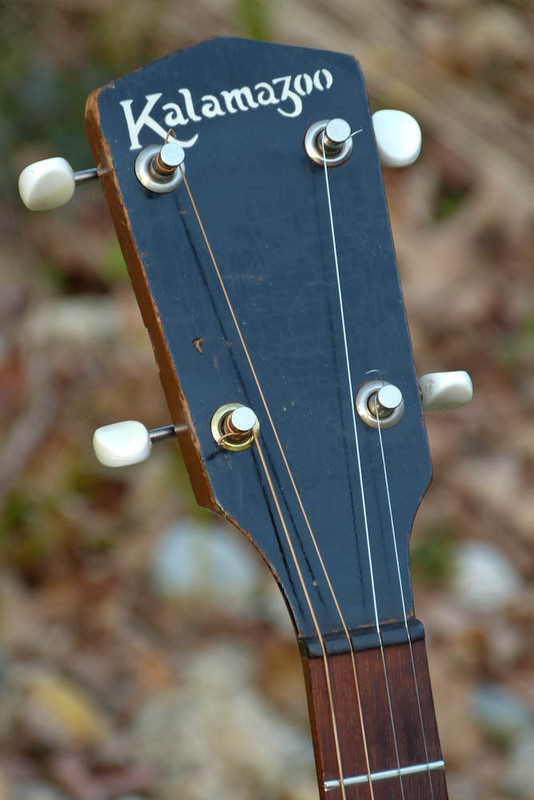 The nut is ebony and this has a 1 3/16" width and a medium-heft C-shaped neck profile with a hair of V to it. 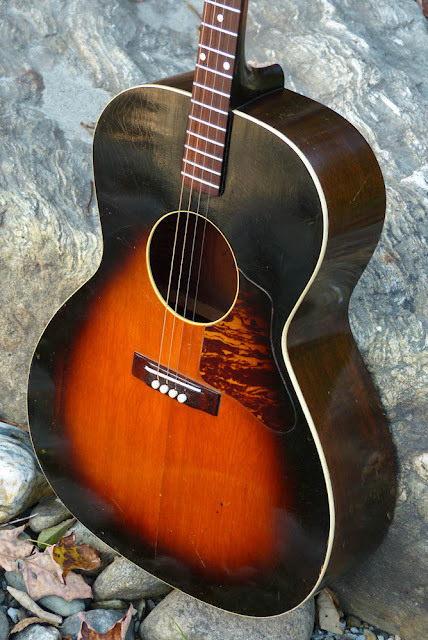 ...and how about the firestripe pickguard? Lovely. 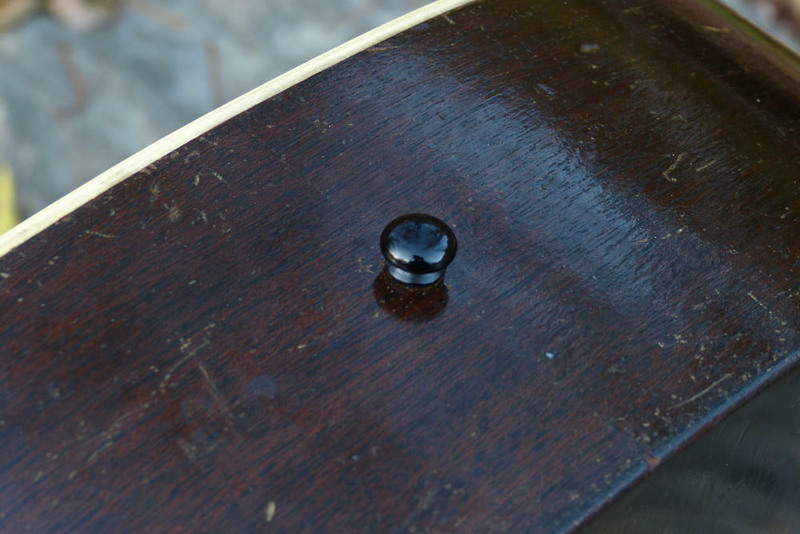 There's some pickwear on the upper bout but not a ton. Also: the finish has all the general crazing and weather-checking you want to see on these old Gibson products. I very, very lightly shaved the bridge and cleaned-up the worn-out string ramp/slots before setting this up with a new (compensated) bone saddle. After doing the work I re-sprayed the bridge (only) with nitro to keep it looking like the original (sprayed-over) bridge look. 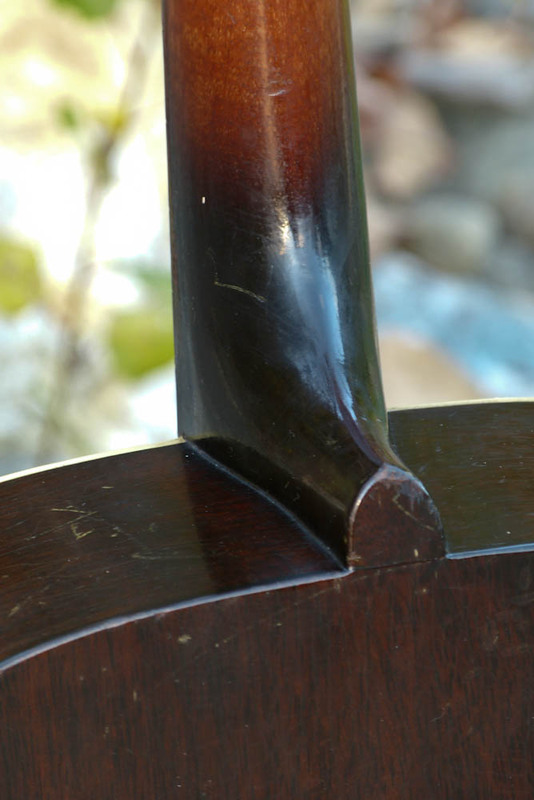 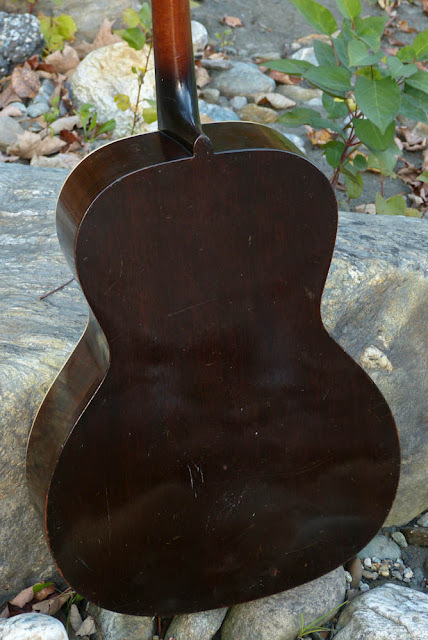 The back, sides, and neck are all solid mahogany. The newer Kluson tuners are "good stuff." I didn't install them but whoever did had their head on right: these are a lot easier to use than friction pegs for the average player. 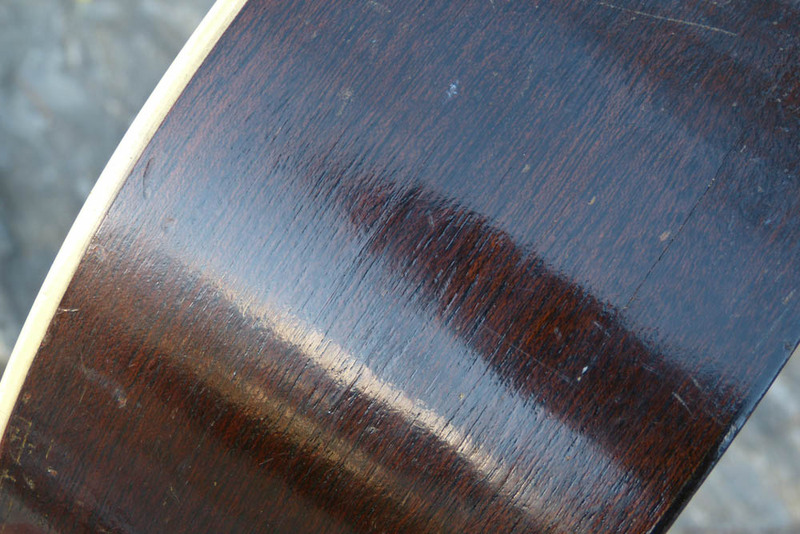 It's hard to see but there are these very little "open grain" or "mini hairline" cracks on the sides here and there. 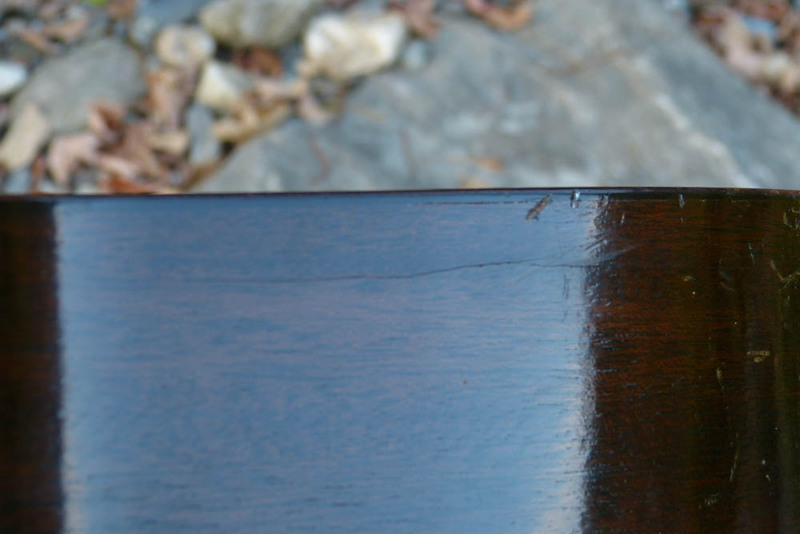 These don't go through the wood and are basically glorified weather-check to the finish. 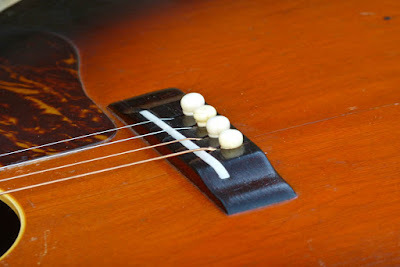 I'm not worried at all as these are common on many old guitars -- but I do mention for completeness' sake. 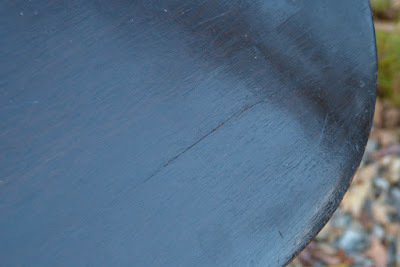 This lone crack on the back is a "real" hairline, but I've cleated it on the inside and it's stable. It's only about 2" long anyhow and was the devil to photo.